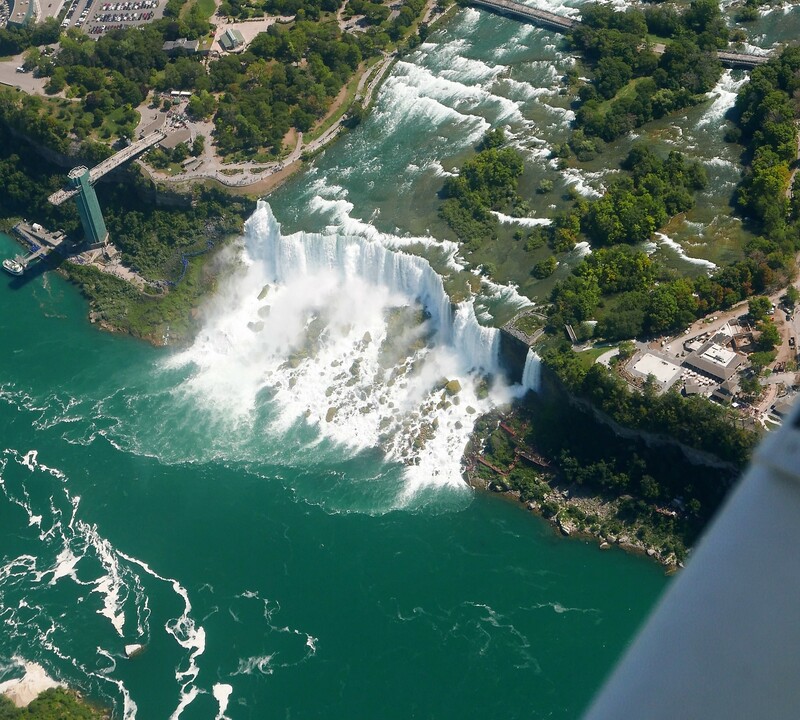 For the last few years, I have been hoping to pull off a trip to Niagara Falls, NY to fly the awe-inspiring racetrack over the falls. 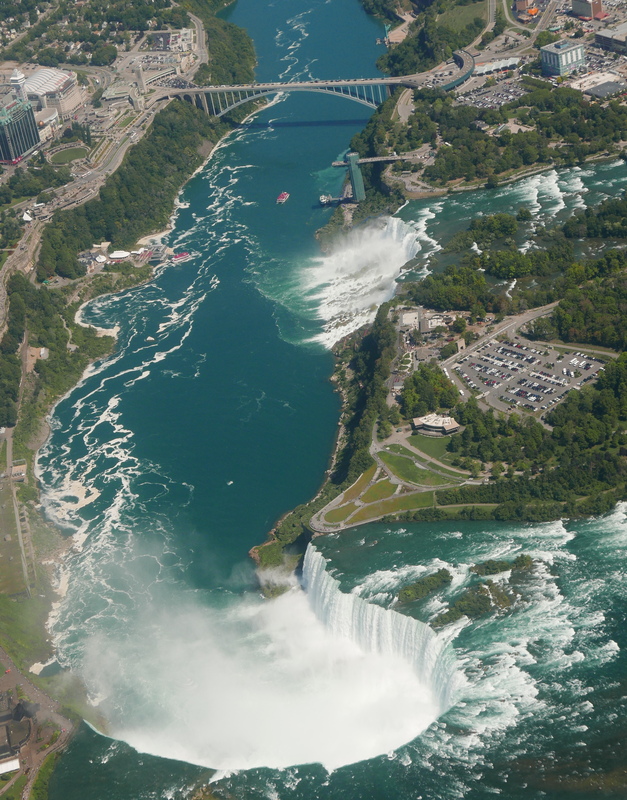 The plan was multi-function: beat the summer crowds, enjoy fall colors, catch the fireworks and most important of all, catch a glimpse of the falls from a few thousand feet above the surface. Each October, I tried diligently to make the plans, got a few people excited, and unrelentingly, each year, brought gloom and disappointment. The weather refused to cooperate. Sometimes it was the weather in the Mid-Atlantic, other times, it was in Niagara Falls. Either way, plans canceled we flew close to home to Tangier Island, attended refresher classes or just stayed home to catch up on other activities. This year, I was adamant I would try to make it in August when the weather would hopefully cooperate. Although, I got a few people excited as the day approached plans fizzled out with most people dropping off. I almost thought I would miss the opportunity this year too. But as luck would have it, my co-pilot could free up his Saturday and we decided to pull off a day trip! 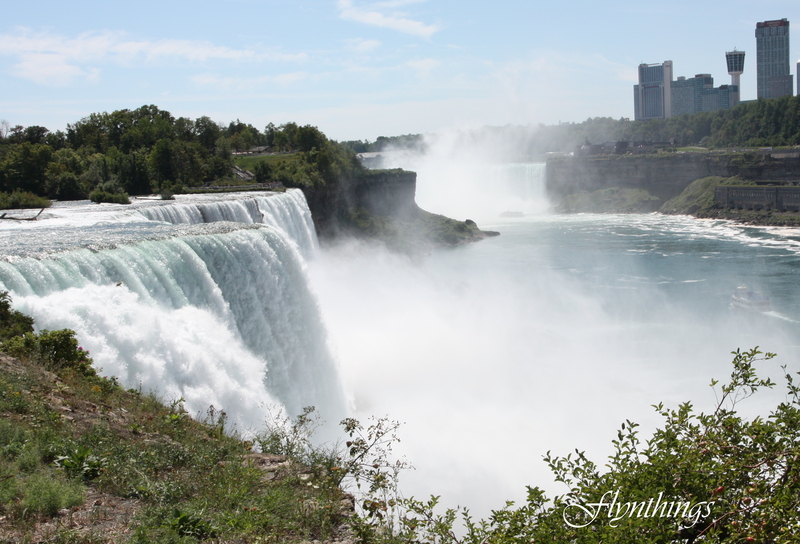 The weekend weather was terrific: in the Mid Atlantic as well as at Niagara Falls and along the way. The shortest direct route would take us there in under 3 hours. Gert and I departed a few minutes past 8:00 am and bee lined north planning the most direct route. Flying in a C172 as usual, we decided to stop over at Akron airport (9G3) NE of Buffalo, for a quick stretch and cheap fuel before heading out to fly the falls racetrack. While the reference content contains some images of where to join the loop and how to fly the race track and how to exit the loop, and it looks good on paper, if you are new to the area, it can all becoming very confusing, very quickly. 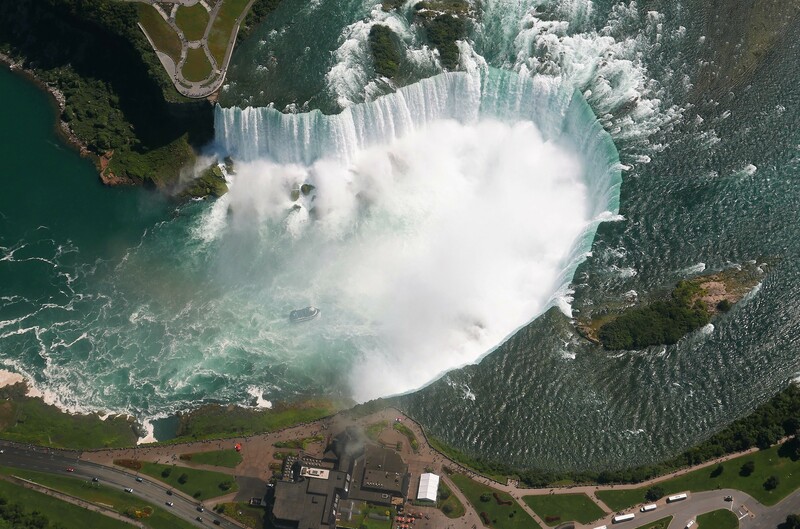 Even though, I have visited Niagara Falls several times via a road trip, it still made it difficult to identify land marks. There is no indication of how long the racetrack is or how to enter or exit it if flying from the US. Flying from Akron is a direct flight. Contact Buffalo Aprroach on departure and obtain a squawk code and clearance through their Class C Airspace. About 20nm due west, flying a heading of 280 degrees, places you right over the Navy Island. One entry point to join the race track is to fly a heading of 281. After flying over Navy Island, following over the Welland River all the way to the pointed nose tip will put one on the race track. 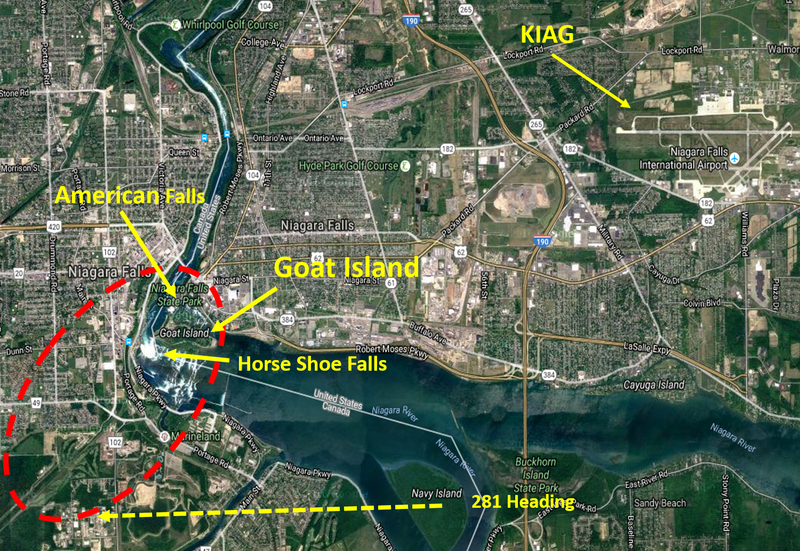 Turning in bound on a heading of 051 degrees and flying all the way to the rainbow bridge which lies just north of the US observation deck that extends three quarters of the way over the Niagara River and turning around until a heading of 231 degrees in the out bound leg. After flying three loops, trying to perfect our racetrack and admiring the falls, wondering where the heck was Goat Island (:-)) we proceeded to land at KIAG, slipping hard and losing altitude and quite gracefully touch down and tied down for a few hours at the Falls. Tie down at CalSpan includes a landing and parking fee of $10. 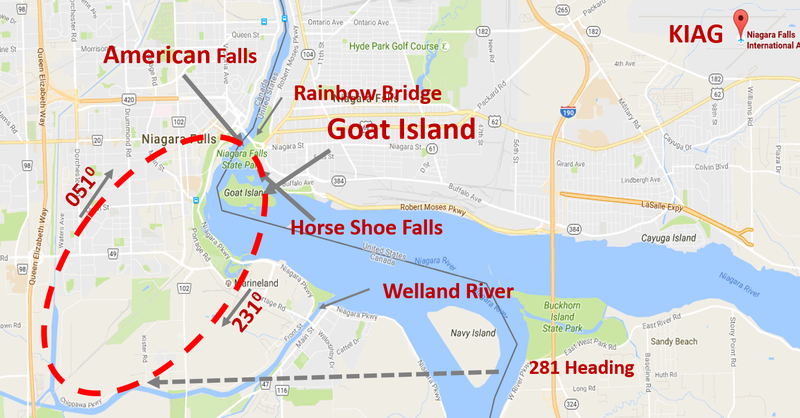 A cab to the falls can be any where from $20-$30 one way. There are several restaurants within walking distance from the airport for that $100 hamburger. Or get to the falls for more choices. I suggest you stay away from the Niagara Falls Cafe at the Visitor Center if you can. Gert and I spent the next 2-3 hours exploring the views from the various lookout points before heading back to the airport and reversing our path back to the Mid Atlantic. It was a quiet evening, we even managed to get a clearance through Class Bravo airspace direct to HEF. All in all, a fantabulous day of flying! I have never seen the falls but it looks exquisite. Your writing is outstanding. Curious…are you a writer or a photographer/? I love blogging but I don’t have wonderful experiences like you. Please keep blogging I enjoy every one. Neither. 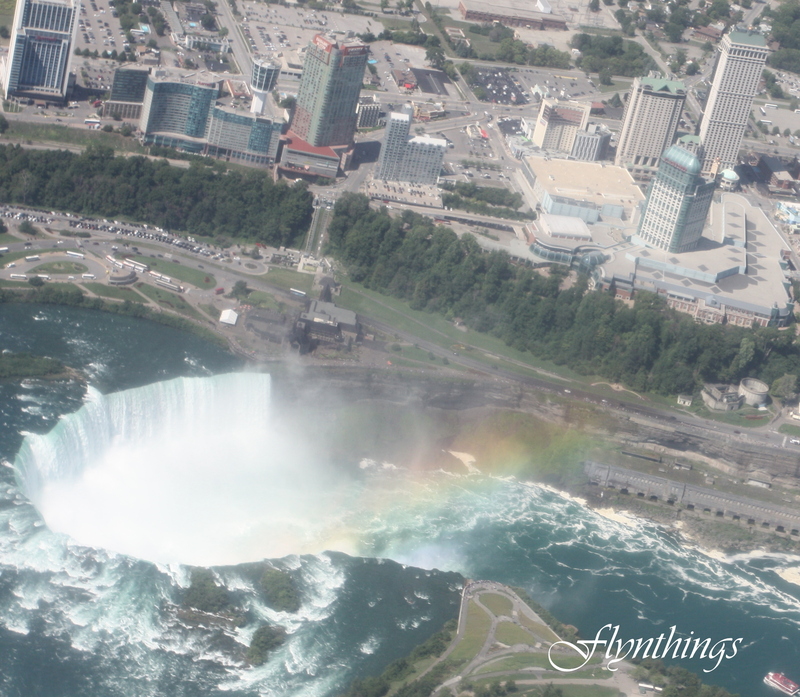 The aerial photos in this post were taken by my copilot using his nifty cameras! Thank you for your kind words and keep up the good work on blogging about women who flew in the early years.